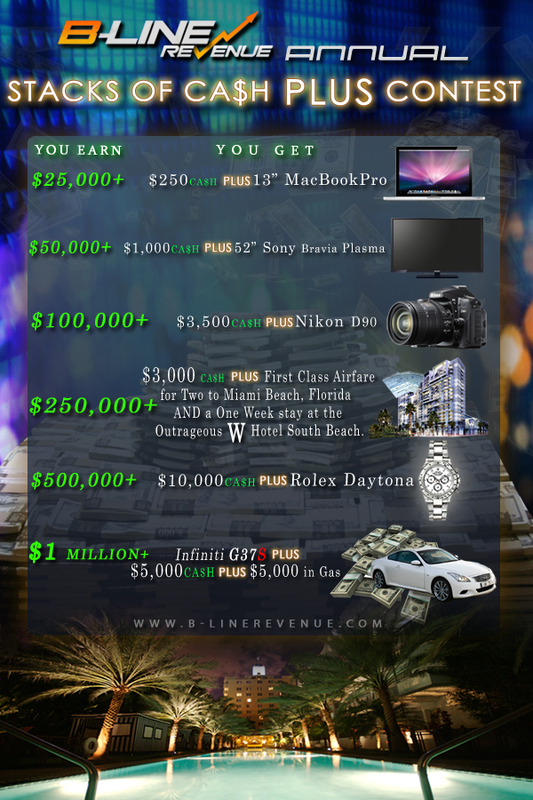 Join B-LineRevenue through the link on this blog if you are not a current affiliate already, current B-Line affiliates, as always, are AUTOMATICALLY placed in the contest. Please put in the notes of the application ?B-Line Revenue?s annual stacks of cash plus contest? to assure your place in the contest.? From right now, through September 30th , start earning for your chance to win outrageous prizes. 2. Follow @BLineRevenue and Tweet about our stacks of cash plus contest on Twitter from your account and you will automatically be eligible to win a $50 iTunes gift card.? SIX different prizes will be awarded. One Prize every 10 days. 3. All you need to do is make a post on your blog about our annual stacks of cash plus contest and link it back to this blog. TWO iPod Nano?s will be given out at random over the course of the contest, one per month. B-LineRevenue reserves the right to have final say on prizes and participation. Once a specified commission level is reached, you will receive that individual prize, one prize level per affiliate. Prizes are combinable (picking different prizes that are equivalent to your reward earnings) All prizes can be converted into cash, just let us know. For international publishers, in the event that we cannot find a way to get the specified prize to you, B-LineRevenue will compensate by sending a Paypal payment or bank wire payment for the value of the prize. Prizes will be sent out within 10 days after final numbers are confirmed.